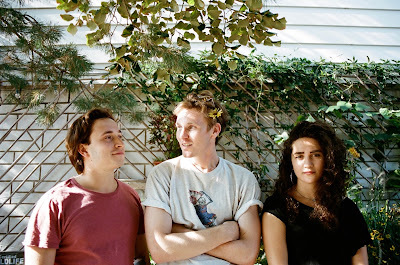 Stream the debut EP from New York's Your Dog. New York-based rock trio Your Dog's debut EP, Talking to Bob, is a collection of simply frank songs chock full of anxiety-ridden guitar work and wistful lyricism. Comprised of vocalist and songwriter Ian Bond, drummer Kate FitzSimons, and bassist Julius Bowditch, Your Dog was a project born in a Bronx apartment among the friends. Talking to Bob opens with uncertainty and wavers between hushed strumming and raucous, crackling distortion. With lines like “I just wanna feel like a little boy,” on second track “Saurkraut” and “I don’t wanna get old, no / I don’t wanna get a job,” in its closer “666,” Bond’s songwriting unearths forgotten childhood memories and an intense discomfort with change and growing up. Switching between gritty power chords and wayward sunny riffing, Talking to Bob is a sonic conversation, swinging from reliving the reassuring safety of childhood and zooming back to a harsh and disturbing reality. Bond enlists singer Ellie Kelly for backing vocals for the EP’s last two tracks where he revisits his acute longing to escape elsewhere when faced with disquieting social pressures. Her lucid vocals carry like a subconscious on the closing song, “666,” making it seem as though Bond really is talking to a voice inside his own head. Most ongoing internal battles last forever and Talking to Bob is no exception. Without a real conclusive end, it trails off with the faraway wails of a saxophone, perhaps as a testimony to the constant qualms that are inseparable from the act of simply being alive. "I recorded / wrote this EP over the course of two weeks in my apartment in the Bronx where I live with our drummer, Kate FitzSimons (with the exception of 666, which I wrote while in a project called Social Smoker with my friend Adam Fales). It was pretty simply the result of me, Kate, and Julius wanting to play shows with the songs that I had written. I had been in a band Margo that was short-lived but very meaningful and important to me. I really loved the experience of being in a band with my friends, and once Margo dissolved, I dabbled in a few projects before finally stumbling into Your Dog. It’s my first time playing only my songs and having creative control, which I was initially worried about and somewhat scared of, but now it’s all flowing pretty well. I don’t really know how to talk about musical inspiration because I don’t feel like I have a firm grasp on what I want us as a band to even sound like. We’re still working on our sound and our songs - trying to get to a point where we know where we stand as a band. But those formative years where I first came to New York and my time in Margo are undoubtedly influential. The name of the EP actually has a funny story behind it. So, whenever Kate FitzSimon’s dad, Bob, is talking to himself, he proclaims that he is 'Talking to Bob.' Kate and I talk to ourselves a lot in our apartment and it’s confusing, so whenever we’re talking to ourselves we say we’re 'Talking to Bob.' The EP is very much me talking (or complaining) to myself about things in my life. Specifically, guilt over unjustified angst, the fear of inadequacy as a musician and songwriter, and a certain aphasia that is only halted by moments of miscommunication. It’s somewhat rushed and ridden with immaturity, but I feel as though that’s who I was when I wrote and recorded it. We’re definitely growing as a band and as people, and we’re excited to record the next album as a full group." Listen to Your Dog on soundcloud. Meilyn Huq is a freelance writer living in Brooklyn who likes to put Tahin seasoning on everything and plays in the band Rhea. You can find her on twitter at @meilynhuq.